Voegelin, Salomé, Sound Reason (2013) Writing as Phonography | Delhi Soundwords. In: Sound Reason Conference and Festival, November-December 2013, Delhi, India. A sudden curtain of sound, rushing, instantly cooling. A fluid thickness, solid, veiling its own transience. Screening all other sounds it cleans the room. It does not mute them but fades them down into a distance that is still near but unpassable for now. (August 21, 2010, 10:12pm, www.soundwords.tumblr.com). Language has great difficulty in locating sounds and finds it hard to testify to their existence. The name ‘the sound of the rain’ is not the sound’s name, it is the rain’s attribute, and thus I cannot place the validity of the thing of the sound in it, I cannot make it an object. ‘The sound of the rain’ has the function of making us alert to the rain, that is however not the function of the sound, it’s the function of ‘the sound of the rain’. The sound itself has no function, and so my experience of it, once we disregard the signification of its source, is much harder to locate, and harder indeed to articulate in language. This presentation starts from my phonographic practice of writing the everyday soundscape. It discusses the relationship between words and sounds and puts forward a language that is part of the listening practice, and that understands that this participation is generative in that it produces words, the material of language, in response to the material of sound, and invites listening as a material process also. Such writing could give us access to an alternative state of affairs, the “what could be” or indeed the “what there is” if we would only listen. It draws attention to what there is constantly and contingently produced, in the complex plurality of sounds, its processes and materialities. This talk will discuss writing about sound in order to try and encourage you to write about the sound of Delhi as a daily phonographic practice that uncovers the possible, the alternative state of the city, from its sound that is not its attribute but its material reality. 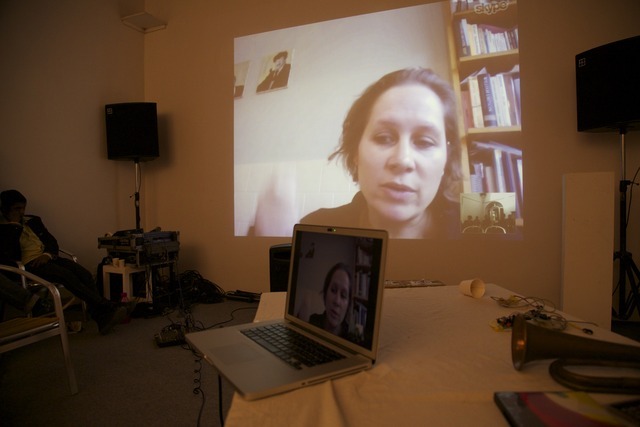 Delhi Soundwords is a guest edition of Salomé Voegelin’s regular blog http://www.soundwords.tumblr.com, to be published in connection with the Sound Reason Festival. This blog writes the soundscape, sonic events and occurrences of the everyday through listening: working from the heard into words to draw attention to the listening process and how we participate in our acoustic environment. The blog illuminates what a transcription of listening can produce, how it can narrate our surroundings differently, leading to different insights, sensibilities and consequences about the world we live in and how we live in it. Artists, audience members participating in Sound Reason Festival as well as all listeners are invited to contribute with blog-entries, to make their listening of Delhi heard. The aim is to provide a different image of the city, one made from the relationships, processes and materials forming below the surface of the visible; to explore the landscape through its sound, to hear it as an environment, a timespace place that does not afford us a vista but grants us access to the mobility of its own production.